Ooty was gentle and peaceful as we sat outside the house. 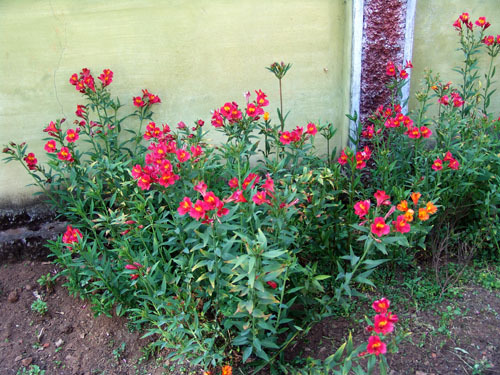 There was a herb garden at one end and beautiful flowers hanging around the entranceway. In January, it was not too warm. The three Kurumbas were young, all dressed in white, and one spoke English well. An older gentleman, a Toda elder, was there as well. The Nilgiri Hills are in the far western part of the Indian state of Tamil Nadu and extend into Karnataka and Kerala as well. They are one of the most beautiful places in the world, with steep hills all covered in blue-green trees and gray rocks jutting up out of the hills, all looking as if it has been there for millions of years, which it has. On the drive through the hills up to Ooty, I kept wanting to jump out of the car to take photos, but you just can’t do that on a steep incline, on a narrow road, filled with lots of traffic all jostling to get up hairpin turns, so I suffered, passing though incredible beauty. I even had a feeling that my camera by my side was suffering along with me. 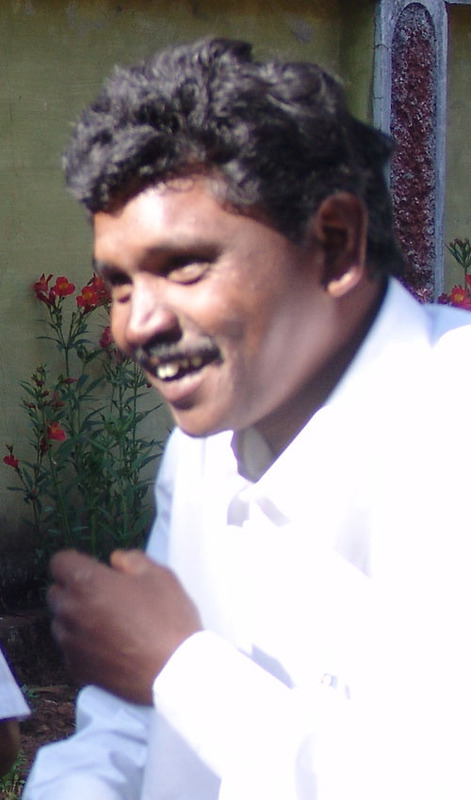 Mr. Kumaravelu, who was my guide, is an extraordinary individual who does an extraordinary job as the Field Officer for the Nilgiri Biosphere Reserve for the C.P.R. Environmental Education Centre. 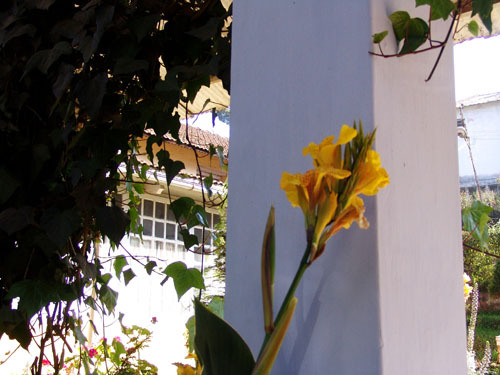 Based in Ooty now, he also grew up there, and he had arranged the meeting with the three young Kurumba men. When I asked him later how he had come to know them and how he had gotten involved in working in this area filled with forests and forest people, he told me that when he was a child, he had been from a family that was not very well off. He had gone with his mother many times into the forest to collect fallen branches for firewood. They occasionally came into contact with the Kurumba people, and he had gotten to know them. Throughout his years growing up and beyond, he had continued to go often into the forests. He remained in touch with the Kurumba and other tribal people in this way and would often stay with them. The Kurumbas had caught a bus to come to our meeting. Beyond the point where they caught the bus, there are paths through the forest to small villages where they live. The main tribes in the Nilgiris are the Toda, Kotha, Irula, Kurumba, and Paniya. The Paniya are mostly farm laborers. In general, the Nilgiri tribal people were hunter-gatherers, who have, for the most part, gradually become farmers. I had read that the Kurumbas are known for being magicians, so I was hoping that they would be able to tell me tales about flying through the air. This hope did not quite materialize. Still they were fascinating all the same. The tribal people in the Nilgiris now number around 24,000. A few thousand of these are Kurumbas. They have lived where they currently are for two or three thousand years. The Irula used to be nomadic. The Paniyas are widespread and are in Kerala too. In the Kothagiri region of the Nilgiris—about 25 kilometers (15 miles) east of Ooty, near a Kurumba village called Vellaricombai, there is a prehistoric rock art site that is very ancient, 3,000 years old, known as Eluthu Paaria. The Kurumbas say that these paintings were done by their ancestors. This is the village where the C.P. Ramaswami Aiyar Foundation began to work with the Kurumbas, arranging for them to learn to do their tribal art paintings on paper, so that they could be sold as a means of livelihood for them. 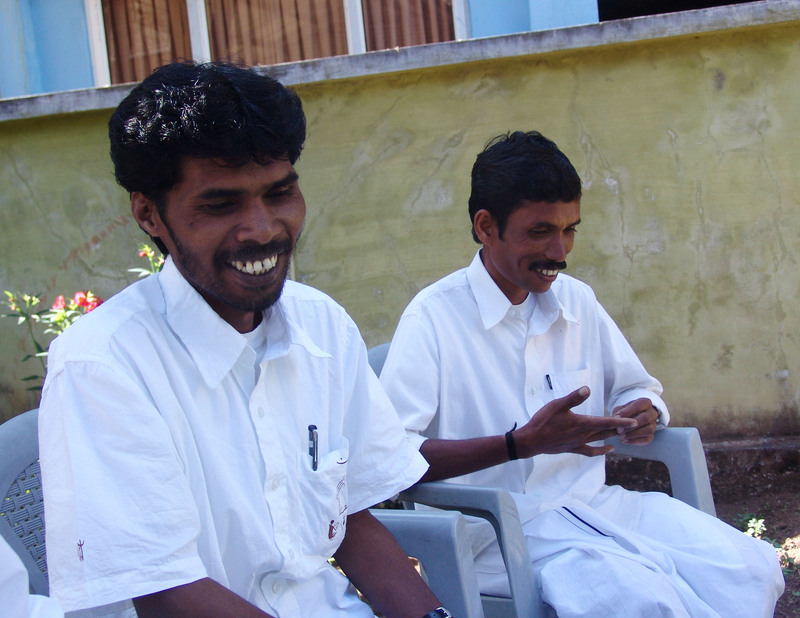 The three Kurumbas who sit with me in the garden are Balasubramaniam, Krishnan, and Kannan. All three are artists, and they have brought two paintings with them, which I am happy to buy. 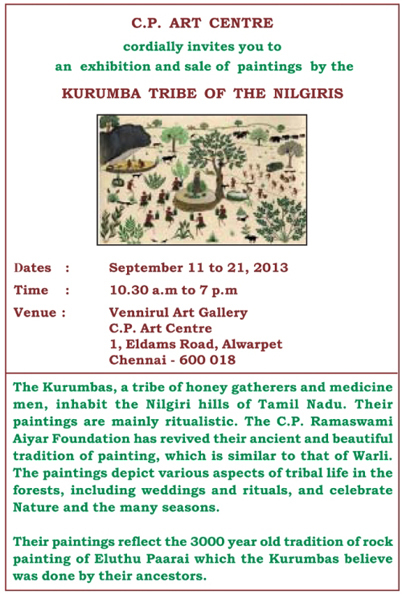 A while ago the traditional art of painting of the Kurumbas was dying out. Only one older man in the village knew how to paint, and he painted, just once a year, on the walls of the temple. When the C.P.R. Ramaswamy Aiyar Foundation discovered him, around twenty years ago, during the course of a project documenting the arts of crafts of the Nilgiri tribes, they talked with him, and then hired him, first to teach his grandson, Kitna, how to paint. The artist of the Foundation’s Art Centre showed them how to paint on paper instead of walls, and to use brushes instead of the traditional twigs, as well as water and poster colors. Kitna then was able to teach twenty other young people how to paint, and in this way, their traditional painting was preserved and did not die out. The traditional designs and forms are much the same as they always were; the difference being that now that the paintings were done on paper, they could be sold, and the Kurumbas were able to make a living. This was helpful, not just to the Kurumbas themselves, but also to the animals of the forest, especially the tigers. Dr. Nanditha Krishna, the Honorary Director of CPREEC, who was not along on this trip, but who I talked with later in Chennai, explained to me that the Kurumbas, with no way to make a living since they could no longer rely on their traditional hunter/gatherer relationship to the forest, had fallen into the habit of aiding poachers to catch tigers. Along with other gods, the Kurumbas worship the hills and the animals, so they know the characteristics of each animal species and the ways of the forest. Poachers are generally paid by middlemen; some are part of poaching rings that are being run from as afar away as China. Even the poachers themselves were not, in this case, local people, but they were paying the Kurumbas, who knew the forest well, to lead them to where the tigers could be found. Once they had an alternate means of income, had attended the presentations of CPREEC, and had understood that the tigers are threatened with extinction and that they need protection, the Kurumbas stopped helping the poachers. Instead, active, youth conservation groups were formed, and now they turn poachers over to the Forest Department for prosecution. The number of tigers in the Nilgiris, in the areas where the Kurumbas are, has been increasing, though the numbers have been falling in the rest of India. The three young men tell me that animals are like humans, and they have a right to live in the forest. To visit the websites of the C.P.R. Ramaswamy Aiyar Foundation and the C.P.R. Environmental Education Centre, please see the Blogroll above, on the right.